Can You Build in the Winter in Central Alberta? Winter in Central Alberta is known for its below freezing temperatures. Even the “highs” rarely tally above the 0°C mark. This leads many businesses to ponder whether or not starting a commercial or industrial build during the season even makes sense. Below, we detail the scenarios of beginning a construction project in the winter and a few reasons why it may very well work in your favour. We recently provided information on permit requirements unique to the Central Alberta area. While the application process in Sylvan Lake, Red Deer, and the surrounding region is one of the most favorable around, beginning the process in the winter is even better. Fewer businesses and organizations are applying for development permits at this time of the year, which means that your application/s will be pushed through at a faster rate. With all of your document ducks in a row you’ll be able to break ground on your construction project sooner than those waiting for the spring season to arrive. It’s true that excavating in the winter can be a challenge. Certain temperatures can make it downright impossible for some. However, there are cold weather construction methods that can be employed to properly excavate ground to begin a build in the dead of winter. This will give you a head start on the year ahead. Pouring concrete is more of a challenge, and many contractors require three consecutive days of above-freezing temperatures before they will pour. But as with excavation, there are methods to make it more viable. Examples include the use of chemical accelerators, curing blankets, and the inclusion of additional cement to the normal mix. Excavation and concrete pouring in the winter comes with many contingencies and timing will be on a case by case basis. And while this may make the work more cumbersome and take longer for the foundation to cure, the intensive care that goes into a winter build can result in an even stronger foundation (depending on your general contractor, of course). Many envision snowfall being disastrous for a construction site. In reality, it is much more difficult to protect and tarp the sensitive points of construction during heavy rainfall. 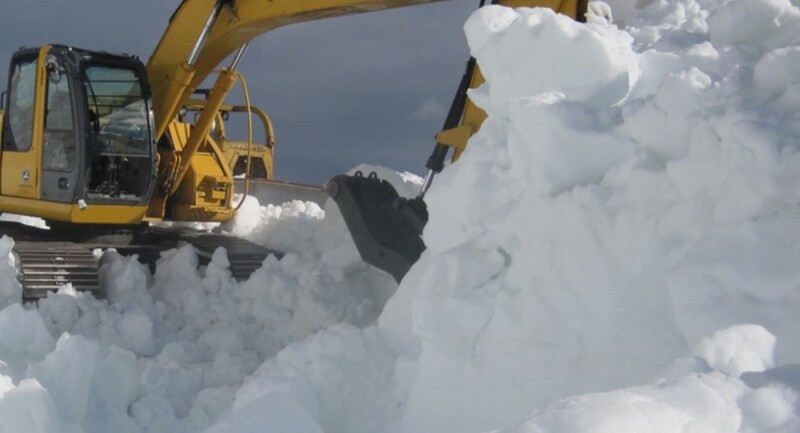 For all of the perceived challenges of winter construction, it is easier to keep your site dry during winter snowfall than it is during the heavier rains of the spring season. Given the fact that there are fewer construction starts in the winter, your likelihood of securing a preferred general contractor increases. With fewer clients clamouring for their attention, you may have a better shot at a lower estimate than if you were to approach them when their docket is nearly full for the season. If you were to bring in a general contractor from the outside, one that was not expertly versed in construction particular to the Central Alberta winter climate, your project could indeed be in trouble. Thankfully, you don’t need to go this route. By securing the service of a local builder with years of experience in commercial, industrial, and municipal construction through all of the seasons you gain a competitive edge over those opting in another direction. Apple Building Systems Inc will guide your project from start to finish regardless the temperature or time of the year. We’re ready to break ground for you, no matter how cold it may be. Contact us to learn more.